Hi, I started collecting vinyl Lp's and 45's in 1971, I have 20,000 + which I have moved now 4 times, and about to move again next year. So it's time to let at least half go. Most are in at least Excellent condition. I can't listen to them all, so most will only have visual grading, any with a high start price, I will listen too, and play grade. 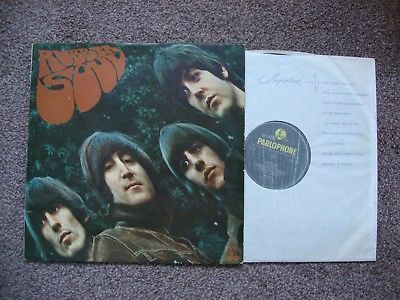 THE BEATLES :- RUBBER SOUL... RARE 1965 UK "MONO" 1st PRESS. "ALL TIME CLASSIC BEATLES ALBUM". 1965 UK EMI PARLOPHONE Matrix XEX 579-4, XEX 580-4. COVER:- NEAR MINT, VINYL:- NEAR MINT, INNER SLEEVE :- ORIGINAL EMI EMITEX. Legendary sixth BEATLES studio album. this album was released in the UK On the 3rd December 1965, This is a very rare Beatles album and one of the rarest presses on solid vinyl and nigh on impossible in this condition. In UK 1965 people didn't have good Stereo equipment so most stereo records were ruined by being played on dancette type of gramophone. With heavy playing arms that often damaged the vinyl. A true BEATLES Classic! You would be hard pushed to see a better vinyl record, looks hardly played. I don't need to tell you how many Lp's got scratched and ruined by heavy weighted arms and metal needles. This is the SUPERIOR UK EARLY PRESS version... So hard to find in any playable condition, as they have been squirrelled away in collections or worse thrown away, Nearly all copies that turn up have terribly worn Covers, mostly with the owners name written on them. I believe that there are very few better Condition Beatles albums, you would be hard pushed to find better. The sleeve is laminated front, not the back, without any Major creasing. An opportunity to own a Mega Rare true BEATLES classic. NEAR MINT : - . The vinyl is bright and has a shine No damage or audible scratches, light marks. NEAR MINT :-The cover is the Garrod & Lofthouse.. Look at the photo's.....wonderfully laminated front cover, the condition remarkable consider it's age, has no splits or tears, please look at the photos the cover is prone to wear due to the lack of lamination (Back) No writing or damage,rare in this condition. In 1965 they were not cheap at the time at 21/6.+ the average wage being £25 at the time. Most copies were played to death. This Sleeve is in amazing condition. EXCELLENT. Original Emitext type, ... being the very fragile inner sleeve is a great indicator of the amount of usage the album has had. I would say the inner is the best you could find! and considering how fragile these are.....they are nearly 50 years old, quite unbelievable intact condition. Clean, no damage or writing. GRADING SYSTEM: In order to assist everyone who buys and sells rare discs, Record Collector magazine has originated a set of standards for the condition of second-hand records, I have added a (+) or (-) to my gradings where applicable. Items must be payed for within five days. If non payment within five days, I will then instigate an Ebay ruling. I will set up a dispute and either offer it to the runner up bidder or relist. I aim to provide an excellent service and hope that all buyers are satisfied with their purchase. However, if for any reason this should not be so, please contact me. I do accept returns, and on receipt of the item I will give a full refund - however - I will not refund what it costs the buyer to send it back, as otherwise I am just paying for the customer to look at it. I will not issue a refund if detail that is clearly stated on the advertisement has been missed by the buyer, so please read carefully. I use preformed and standard mailers with stiffeners. I always take the vinyl out in its inner sleeve and place on top of the cover. This is then placed into a soft protective sleeve and packaged with stiffeners for full protection. Please wait for an invoice before payment. I ship every Friday, providing the item has been payed for. The prices below are based on one album, however if several albums are purchased, please add £1.00 per album. All EU and Over Seas purchases must be signed for with a value of up to £46. All purchases are sent Royal Mail first class. UK & CHANNEL ISLANDS: Royal Mail Second Class will be £1.80. If the value exceeds £10, it will be sent first class signed for which will be £4.00. EUROPE: First class signed for will be between £12.00. ALL OVERSEAS (NON-EU): First class signed for will be £16.50. Please bid with confidence and check my feedback. I aim to provide an excellent service, so please get in touch if you have any questions. Thank you and good luck!